I do enjoy baking my own bread. Sofar i used the recipe for the rye spelt bread i posted here in January this year. Only when i had a cold for a week or two, i bought bread in the shop. Today i made another bread, for the first time: soda bread. I have read about soda bread before. I know it is quick to make. You do not need to knead the bread and let it rise for an hour or more. It is a chemical process, with baking soda and a sour milk. So today i checked my stocks and went to the shop: i needed buttermilk and more wholemeal flour. 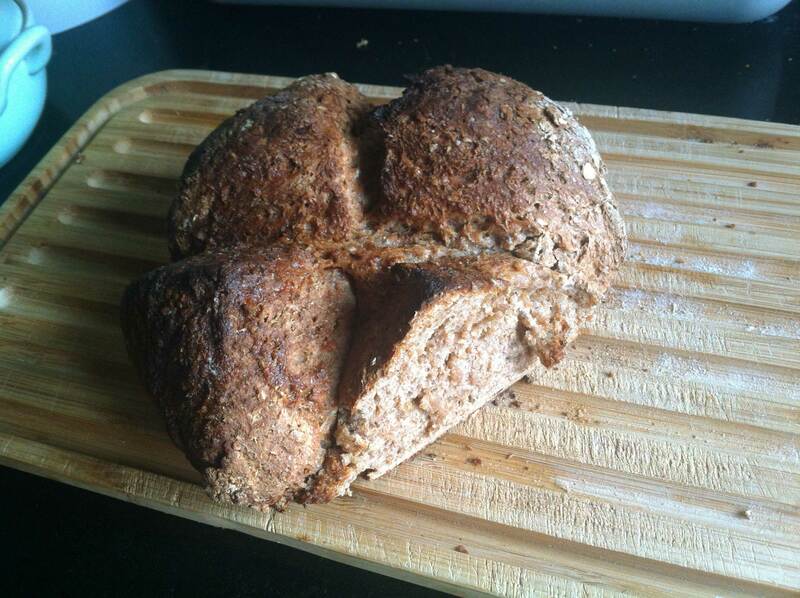 I had decided to use the recipe in the Guardian on the How to cook the perfect soda bread page. The one thing i changed is the treacle. I don’t have it. I’m not even sure we have that ingredient here in the Netherlands. OK, i just looked it up. It is most likely the same as keukenstroop. Which we do have. I’m not a big fan myself, or better said, i never bought the stuff. Anyway, i used two tablespoons of honey. Works just as well. Making the bread is really easy. You do need to heat up the oven to 200C first. Once the oven is warmed up, put all the dry ingredients in a large mixing bowl and whisk together. Make a well in the middle. Stir the honey and buttermilk together than pour this into the well. Stir this very quickly together with a fork, later on with your hands. Shape the dough into a round, cut a deep cross into it. Bake for 50 minutes to an hour. After it is baked, brush with melted butter. You can not keep this bread very long. This is the one issue which has prevented me from making it. I ate it with the leek potato i made earlier this week. Tomorrow i will get more, for breakfast, lunch and dinner. Not sure it will be good to eat on Friday. We will see.